The kitchen or dining room is a great place to start. First, find a cream or white textured tablecloth and drape it over your table. Using fishing line, you can dangle pinecones, silver bells, or doves directly above it. You can place white and silver candles in clear holders and spray them with “crystal frost,” which you can find in any craft store. A glass or crystal vase containing white flowers and adorned with rhinestones will definitely sparkle. Add a beautiful centerpiece made from holly, twigs, and pinecones and splashed with an accent of glitter. Do this by painting transparent craft glue on each piece and rolling each in silver glitter. This makes a fun craft project, and you can get the birthday boy or girl to help you out! When decorating the living room, adding artificial Christmas trees can provide a breathtaking, wintry atmosphere. 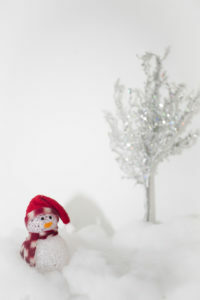 Purchase a few four-foot trees in a variety of “cold” hues such as blue, silver, and white. You can spray fake snow on the darker-colored trees and adorn them with strings of red berries, doves, and handcrafted bird’s nests. 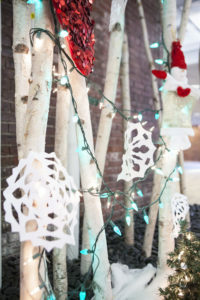 Have your children cover the walls with beautiful hand-cut snowflakes. If you have a fireplace, place framed artwork featuring winter scenes above the mantle and decorate the top with battery-lit candles for safety. Place the candles atop mirrors to simulate an icy finish. You can also trim the mantle’s edges with green garland for a woodsy feel. You can decorate your yard to mimic the inside of a snow globe, even if you live in a subtropical climate! If it’s warm enough, you may even be lucky enough to throw your winter wonderland bash outdoors. Have you considered throwing a winter wonderland-themed bounce house party? Children love the experience of a bouncy, inflatable house where they can be active. 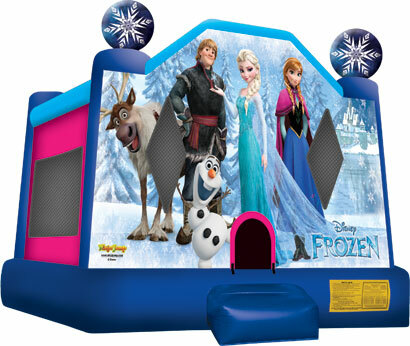 Your bounce house party can feature a wintry castle, Santa’s workshop, or a polar cave! If you do not have any trees in your yard, consider purchasing a couple of sparkly white LED-lit trees. They have over 80 branches tipped with soft lighting that give a realistic snow-covered appearance.To simulate a winter wonderland atmosphere for your outdoor party, start with soft outdoor LED lights. Most of the bright white lights appear bluish, giving them that perfect icicle-like appearance. You can frame the windows and doors with strings of lights, and drape of few strands on the tops of small trees and bushes. You can even rent an inflatable slide to make your bounce house party an experience your child will never forget. Ready to get started working on your Winter Wonderland Party? Call your local Space Walk!